Saudi Arabia has warned the United States against a possible war against Iraq in an exclusive interview with the BBC. 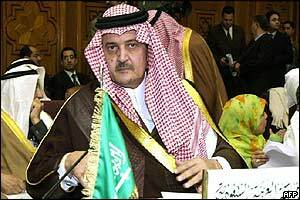 Saudi Foreign Minister Prince Saud al-Faisal has said that any unilateral military action by the US would appear as an "act of aggression". "Independent action in this, we don't believe is good for the United States," he told the BBC's world affairs editor John Simpson at a meeting of the Arab League foreign ministers in Cairo. "It would encourage people to think... that what they're doing is a war of aggression rather than a war for the implementation of the United Nations resolutions." Saudi Arabia has been a longstanding ally of the US, but relations since the 11 September attacks on New York and Washington have been strained. The majority of the 19 suicide hijackers came from Saudi Arabia, whose government has been accused in Washington political circles of not doing enough to counter Islamic fundamentalism among its population. Regime change can only be a possibility if it is done "indigenously", he said. The full interview can be seen on BBC World from Wednesday and on Simpson's World on BBC News 24 this weekend (1130 GMT on Saturday, 0230 GMT on Sunday, 1430 GMT on Sunday, 0030 GMT on Monday).